Herzlich willkommen, fühl dich eingeladen einer Teestunde. Diesmal mussten es rosa Tulpen sein. Beim Discounter sind sie so billig, dass ich zwei Bunde in verschiedenen Rosatönen gemischt habe. 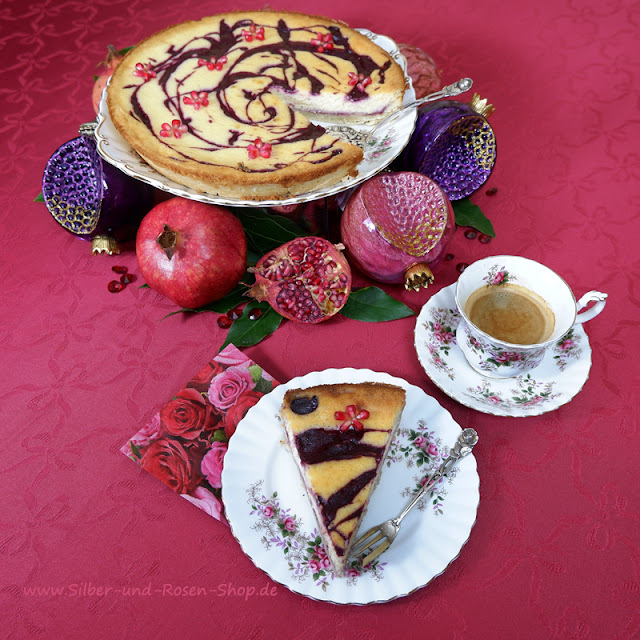 Rosa ist eine herrliche Farbe. Welcome, feel invited to a tea party. Today it had to be pink tulips. They are so cheap at the discounter. So I mixed two different bunches to a bouquet. Pink is such a cheery color. Das satte Gelbgrün der Tulpen bringt die rosa Köpfe richtig zum Leuchten. The luschious yellow green of the tulips brings the pink blooms to shine. Auch draußen im Garten blühen schon Lenzrosen in rosa. Die liebe ich ganz besonders. In the garden I have also pink flowers. 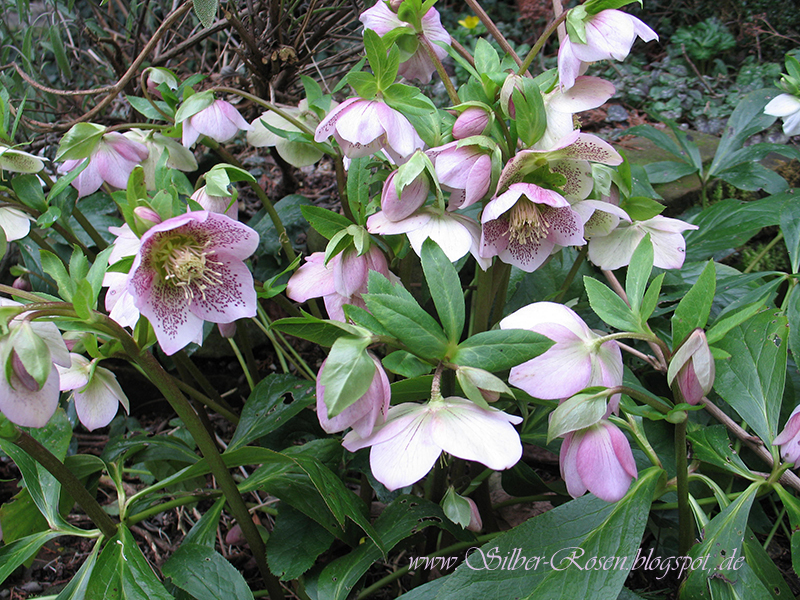 My lentenrose is blooming. I really love it. Heute trinken wir einen grünen Tee mit Mango-Ananas-Stückchen. 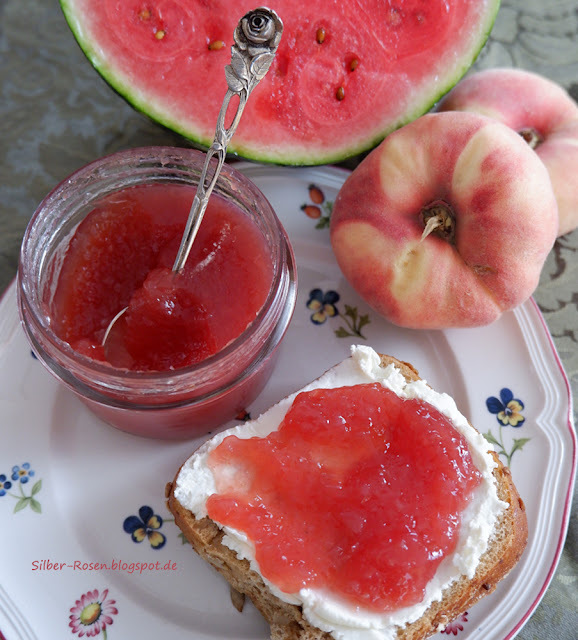 Das schmeckt fruchtig und riecht tropisch. Dazu gönnen wir uns Pralinen. Today we will have green Tea with dried pieves of Mango and Pineapple. Tasts fruity and smells tropic. Additionally we will treat us with pralines. Ich habe uns einen kleinen Teetisch vor dem Kamin gedeckt. Komm, setz dich und erzähl mir, was es Neues bei dir gibt. I have set a little table in front of the mantle. Please sit down and tell me your news. Ich freu mich über jeden Besuch und jeden Kommentar, auch wenn ich im Moment wenig Zeit habe, bei euch vorbeizuschauen. I enjoy so much all your visits and comments, although I have not so much time to visit everybody. Oh what pretty tulips! They are my very favorite flowers. The pink color is so pretty. I got a tea making set, which you can combine tea leaves as you like. I put white tea leaves and rose petals together, and it was really good! Those dishes with the roses and gold are absolutely gorgeous! And tulips are so cheerful. Oh, I do love tulips; especially pink ones! 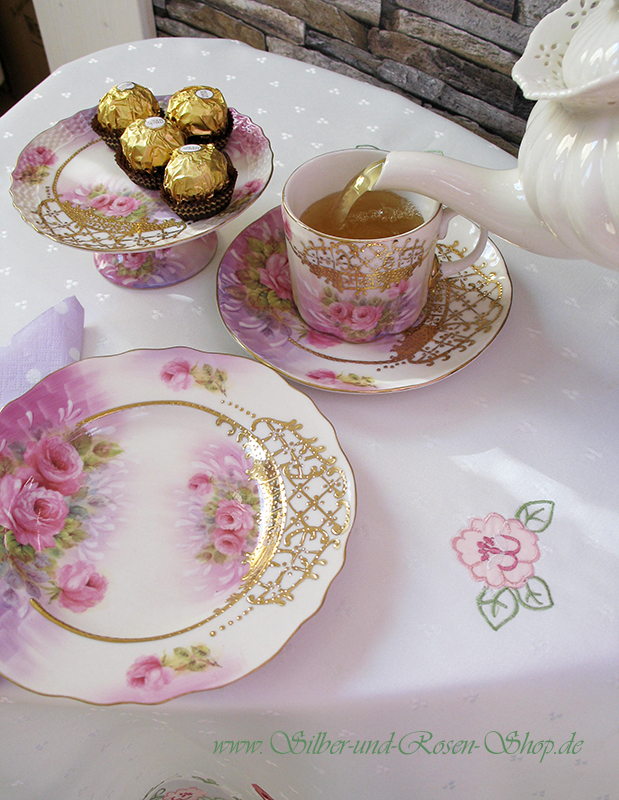 Your rose adorned china is gorgeous, Johanna! What scrumptious roses! Thank you for your lovely tea and for sharing it with us. It's always a delight when you join me for Tea Time. Enjoy your week, my friend. 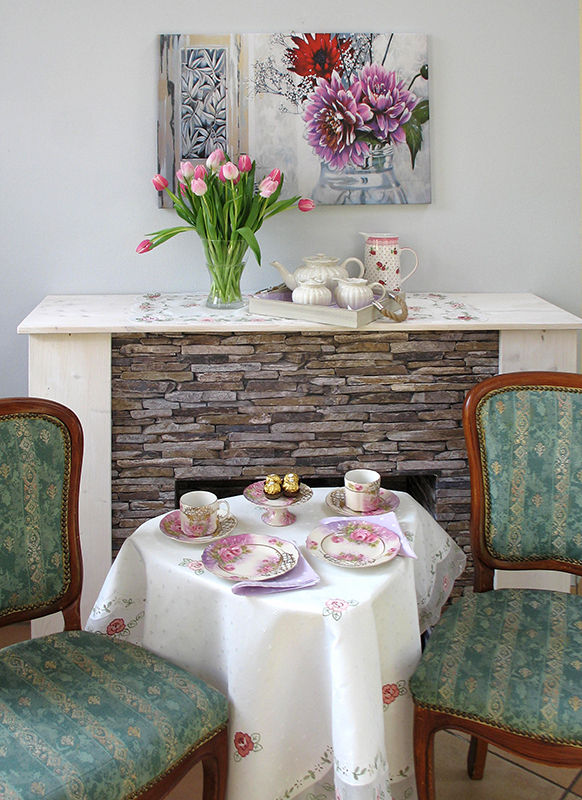 The pink tulips have brought me happiness, they're a sign of spring to come and they match your china. How I would like to sit by the mantle tea table and talk with you over tea. ist noch ein Plätzchen für mich da? Wundervolles Geschirr. Der Teetisch ist so liebevoll gedeckt. Und die Teesorte hört sich lecker an. Die Tulpen sind farblich besodners schön. Gorgeous!. 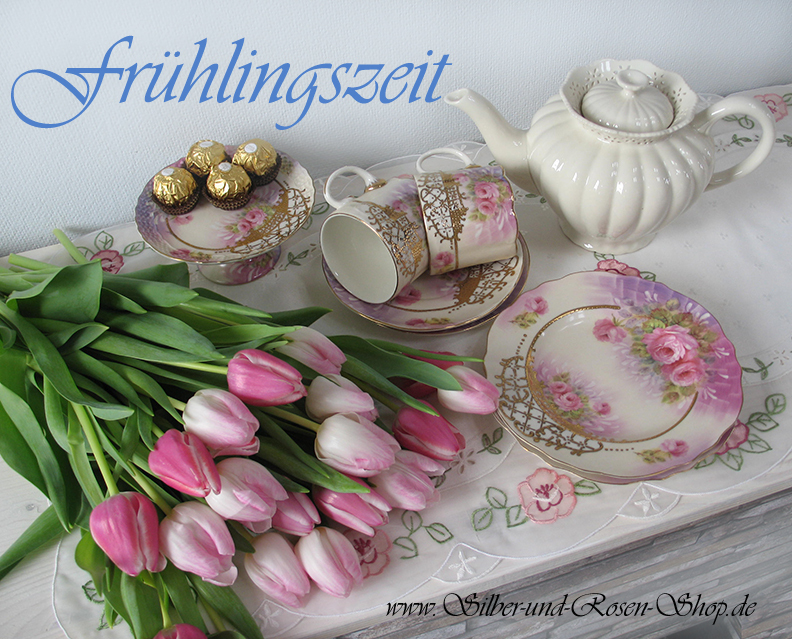 The tulips, the tea service, and the beautiful painting ….. all spectacular. Your dishes are extremely beautiful, Johanna! Love the tulips too! Have a great week! What a lovely setting for TEA! I used tulips for my tea, too, Johanna. I think we all are thinking Spring. Your setting is so lovely and yes, I'd love to sit and chat with you and enjoy tea time. 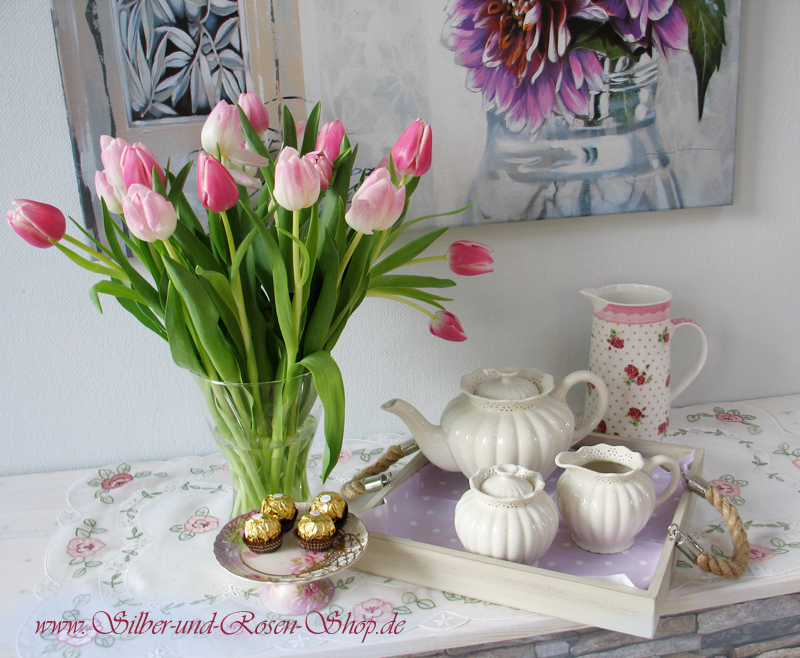 Your tea time today is lovely with pink tulips! I love the china too, as you know I have the tea cup. Such a gorgeous and romantic design this set. It truly does look like a beautiful inviting tea time. Vielen Dank für diesen wunderschönen frühlingshaften Post. Heute Nachmittag habe ich dieses Jahr zum ersten Mal im Garten gewerkelt. Ja, langsam kommt der Frühling. Genau dieses Rosa hatte ich neulich auch. Wunderschön schaut es aus, so zart. Zart wie der Frühling! 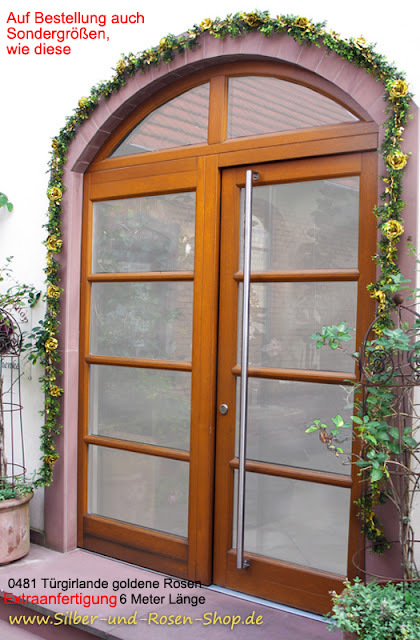 Im Wohnzimmer halten sie leider nicht lange, aber im kühlen Hausflur stehen sie mitunter bis zu 3 Wochen. Oh wow, can I come and sit down?? My favourite colour is pink, I fit in perfectly here!! I LOVE this porcelain, so so pretty. And the tulips... they remind me of springtime. But it also looks like spring in your garden!!! Wonderful. Very pretty Joanna, especially the china with the pink that just jumps out of the picture. And tulips are so welcome right now. Johanna, your tea time is absolutely lovely! Your flowers are heavenly, too. Thank you for such a treat.